Get fitter, faster. 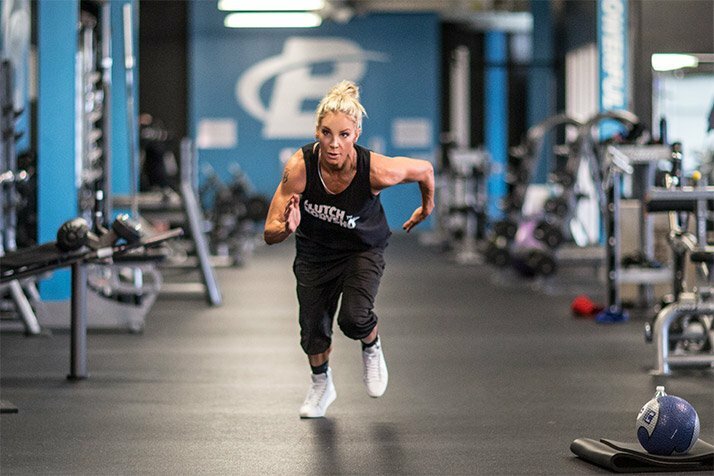 Burn calories quickly with this high-intensity circuit! If you've got 15 minutes, you can send fat fleeing for its life. This six-exercise circuit workout may seem like kid's stuff, but I promise you it's no walk in the park. For each exercise, you'll work as hard as you can for 30 seconds. That means you try to get as many reps as possible every single time. Trust me; after a round or two, 30 seconds starts to feel like 30 minutes! After each exercise, you'll only rest 15 seconds, which is just enough time to get a sip of water and catch your breath before you get right back to work. These short intervals of work and rest mean the workout will only take you about 15 minutes to complete. You can get in, get the job done, and get out! The best thing about this workout is that it's great for anybody. The bodybuilding enthusiast, recreational athlete, or gym newbie can all benefit from this fat-burning workout. It will burn calories and improve your overall conditioning level. 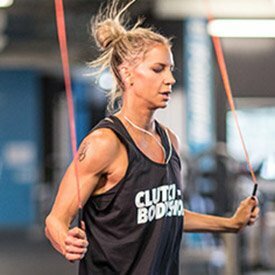 However you choose to implement this fat-torching circuit, I guarantee you'll be glad you did! 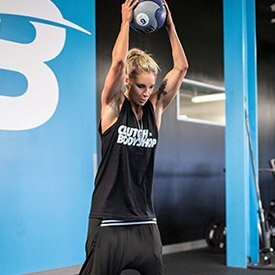 While you can choose a heavy medicine ball for this exercise, I like to go lighter because I want to be able to move for the entire 30 seconds, not burn out in the first 10 seconds. I also want to be as explosive as possible. When performing medicine ball slams, keep your core really, really tight, especially when you bring the ball over your head. An engaged core will allow you to slam the ball to the ground with force. You can perform this exercise in place or by moving around in a circle. I prefer to move in a circle to get some lateral movement into my workout. 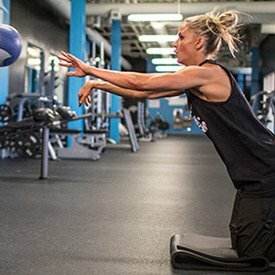 To perform this exercise, kneel on a pad and throw a medicine ball against a wall. As you throw it, lean forward into a push-up. Push yourself back up to your knees and try to catch the medicine ball as it comes back to you. This exercise takes a little practice, but once you get the hang of it, I think you'll really like it. If you've never tried this move, spend some time testing the space between you and the wall. You may also need to work on your timing. Try to catch the ball in one bounce. You have to explode out of the push-up position in order to get back up in time to catch the ball, so this is an excellent plyometric movement that will challenge your body and core in a new way. Shadow boxing is fun, but it can also be really difficult. If you're right-handed, put your left foot forward. If you're left-handed, lead with you right foot. Engage your core and throw your punches as hard as you can. Remember to keep breathing as you punch. If you hold your breath, you'll just fatigue quickly. Keep punching for the full 30 seconds. Your shoulders are going to burn! I love this exercise because it will help you achieve shoulder definition without lifting heavy weights. The half-burpee is simply a burpee without the push-up. Bring your hands down to the ground and kick your feet out behind you. When you bring your feet back under you, keep your core tight. Stand up explosively. This exercise will increase your heart rate and help you build defined, strong legs. It's not a high-impact exercise, though, so your joints won't get sore. Although I utilized this drill in my sports career, I think it's a great exercise for athletes and recreational lifters alike. This drill gives you an opportunity to increase your body awareness by changing directions quickly. Because you're running and moving for the entire 30 seconds, your legs will start to feel it. That's a good thing! When you get tired, just keep moving. Everyone has a different skill level with the jump rope. 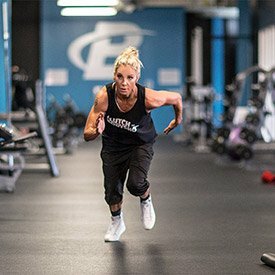 Even if you're not the best jump roper, remember that the important thing is that you're moving. Don't quit early just because you can't do it well. 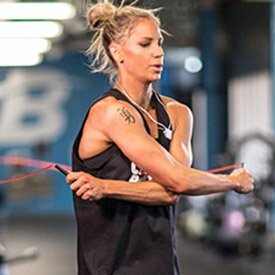 Jump rope is a great exercise to master, so keep working on it! Once you get it down, you'll be able to do it anywhere, and you'll be able to scale the difficulty by adding new techniques and increased speed.